Joe is a retired teacher—just like me! And Joe loves flowers. Me too! His home is a flower garden inside and out. His home is off the beaten path and exists in a secluded spot in the Bucktown countryside accessible only along a dirt road. His home sits high on a hill—almost hidden by the trees. Outside he’s managed to create a garden which grows larger each year. The selection of annuals, perennials, and rose bushes provide a glorious display of color throughout the growing season. He took student Sarah Elphick and me on a tour through his garden during the project’s early years, stopping to name some of his favorite specimens and commenting on their history with him and how they’ve inspired him. Music, art, a love of nature and family enfold this family and enrich their lives. 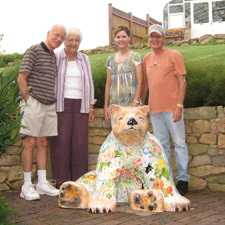 “Flora,” like Joe’s first Bear Fever bear, Paul-bear, sponsored by Ott Funeral Home, is also full of the beauty, harmony, creativity, and peace that envelope the home and world of artist Joe Hoover. Venturing into acrylics, Joe created “Flora” as a stunning example of his artistry painting the flowers he loves. Hibiscus, hydrangea, daisies, lilac, morning glories, sunflowers, roses, carnations, dahlias, forget-me-nots, tulips, lilies, geraniums…and others…cover the body of this spectacular bear. Joe added “frosting” to “Flora’s coat to lighten her looks and a daisy collar as a “bridge” into the garden of her coat. The Hulbers requested their precious kitty “Gigi” join the floral scenery. Jody and Loren Hulber, long-time patrons of the arts, believe that richness in life comes from cultivating and sharing personal expression and creativity. The décor of their home reflects their appreciation for the arts with their collection of art by local artists. Their admiration for the Boyertown bears of the Bear Fever Community started the first time they drove through the quaint, historic community. They were familiar with the fiberglass animal forms, since they formerly lived in Chicago—the home of Cowpainters LLC, the company that creates the molds for such projects. Fieldstone Farm, circa 1740, was originally part of a land grant of the William Penn Walking Treaty, said Jody, who extensively researched the history of the property for her master’s thesis. ?The Hulbers consider themselves stewards of this 120-acre property, the largest remaining single tract in southern Lehigh County. They are committed to sustainable agricultural practices and conservation and participate in the Forest Stewardship Program. Jody, a member of the Pennsylvania Association for Sustainable Agriculture, grows organic apples and produce and is an active supporter of the Macungie Farmers’ Market. She is a beekeeper and raises fancy breed chickens. Loren has a lengthy list of career achievements as an entrepreneur and builder of high performance businesses. He is currently a high performance business consultant to technology organizations. He served as the chairperson for CorrectNet, Inc. and USAData, Inc. He was the former chair and CEO of Incurrent Solutions, Inc., and he supervised the development of several other corporations. Since his youth, at fourteen years of age, founding a business making Christmas ornaments for major department stores, Loren Hulber has been an extraordinary entrepreneur and builder of high performance organizations. Loren has applied his talents to numerous enterprises with outstanding results as well as to charitable and community service organizations. Loren is currently a high performance business consultant to technology organizations. He served as Chairman of CorrectNet, Inc., a leading provider in the rapidly growing $3.0 billion market for data consolidation and web reporting services for asset managers and their investors. Prior to CorrectNet, Loren was Chairman of USAData, Inc., a leading provider of sales leads on demand through web-based solutions for customer acquisition and customer relationship management. Prior to CorrectNet and USAData, Loren was Chairman and CEO of Incurrent Solutions, Inc., acquired by ORCC. Incurrent develops, licenses, operates, and manages advanced customer self-service and electronic billing and collection systems for financial institutions in the global credit card industry. Loren led Incurrent to accelerated growth and profitable operations, Series A and Series B rounds of funding and numerous industry awards. Prior to Incurrent, Loren was founding CEO, President and Chairman of NCES, an outsourced provider of human resource services to thousands of companies and tens of thousands of employees in 46 states. Loren took the company from start-up to $1.3 billion in revenues, completing numerous acquisitions and an IPO, and ultimately selling the company to Fidelity and AFLAC. As President & CEO of Day-Timers, Inc., Loren led this direct marketer of time management tools into reseller channels like Office Depot and Staples, generated record results and produced the strongest revenue and profit growth in the history of this 50 year old company with 4.5 million users. He led Day-Timers into software, acquiring and successfully integrating a leading developer of time management solutions for PC’s and hand-helds. As President of Wilson Jones Company, Loren dramatically re-energized this 100-year-old manufacturer and distributor of office products restoring strong revenue and profit growth. As President and CEO of Durand Corporation, Loren revolutionized this 50-year-old company by successfully introducing the Slant-D ring binder, forever changing ring binder design and usage, and selling the company to Jostens, Inc., subsequently becoming President of Jostens Business Products Group, the fastest growing segment of this NYSE company. Loren was named to Who’s Who in New Jersey, was twice a Finalist in the Ernst & Young Entrepreneur Of The Year Award Program, was named One of the Most Influential People in the Professional Employer Organization Industry by the ProEmp Journal, was interviewed as One of America’s Hottest Business Leaders in First Job, Great Job by Jason R. Rich, and is a frequent speaker and panelist. Throughout his career, Loren has demonstrated a deep commitment to entrepreneurial success in business as well as to charitable and community service organizations. He served as Vice Chairman of the Board of Trustees of Lehigh Valley Hospital and Health Network, one of the leading regional teaching hospitals in the USA. As Campaign Chair of the Lehigh Valley United Way, Loren led the turnaround of the Campaign with a record 12% increase, one of the highest growth achievements in the country. He received the President’s Award for Outstanding Leadership and went on to serve as Vice Chair of the United Way Board of Directors. Loren has been President and a Director of several trade associations, including the New Jersey Technology Council, and also served on the boards of Lehigh Valley Partnership, Lehigh Valley Economic Development Corporation, Lehigh Valley Chamber of Commerce, the Executive Committee of the Minsi Trails Council of the Boy Scouts of America, and the Regional Advisory Board of Wachovia Bank. Loren received the Boy Scout’s of America Distinguished Citizen Award for his service to the community. Loren holds 3 U.S. patents, attended the University of Detroit, and served in the U.S. Marine Corps. He and his wife, Jody, live on their historic (circa 1750) Pennsylvania farm of 120 mostly wooded acres, where they are committed to open land preservation and responsible wildlife management. Jody is quite active as a community volunteer, board member, and organic gardener. Loren also maintains a rotating collection of about a dozen collector cars as a hobby. Jody has a Masters Degree in Liberal Studies from Lake Forest College in Chicago. She is a beekeeper, raises fancy breed chickens, and grows organic apples and produce in addition to being an active community volunteer and board member. We are both committed to sustainable agricultural practices that do not harm people, animals or the land. Jody is a member of PASA and we participate in the Forest Stewardship Program. Our farm, Fieldstone Farm, is the largest remaining tract of land in southernmost Lehigh County, and we look upon ourselves as stewards of this property that dates back to a land grant from the William Penn Walking Treaty to the first of nine owners, who were Swiss. We admire and seek to preserve the practical culture of the early 'Pennsylvania Dutch' who settled and made this land and area prosper.